Today’s recipe is pretty, pink, and delicious! If you like cheesecake (even a little), you are likely going to love this! 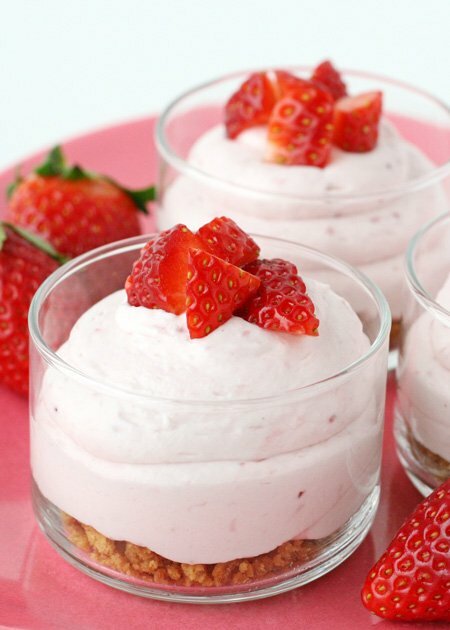 This Strawberry Cheesecake Mousse is light and fluffy, sweet (but not overwhelming), and has a deliciously light cream cheese flavor. I’ve made several similar recipes in the past… first Cherries on a Cloud, then Candy Corn Cheesecake Mousse, then Strawberry Blueberry Mini Cheesecake Trifles. I made a few little changes this time, adding fresh fruit puree to the mixture, (instead of just laying fruit on top as with some of the previous recipes) and also, I used real whipped cream (in place of cool whip). Both adjustments were deliciously successful. I’m sure as spring and summer roll in, I’ll try other fruit purees as well. I like the addition of the crust (the graham cracker crumble) for a little texture, but it is not necessary. This dessert is fluffy and delicious, with a light cream cheese flavor. Crush graham crackers in a plastic bag. Crush crackers until the mixture still has some pea sized pieces (you do not need it to be all fine crumbs). Put cracker crumbs in a bowl and pour melted butter on top. Add 1 teaspoon sugar, and stir mixture until crumbs are moist. Spread mixture into a baking dish (such as a 9"x9" dish) and bake at 350*F for about 12 minutes. 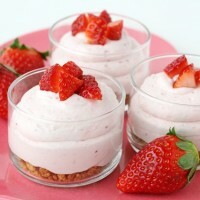 In a food processor, or blender, chop/blend fresh or frozen (and slighly thawed) strawberries. Process until the berries are chopped, juicy, and no piece is larger than a pea. In the bowl of an electric mixer (or with a hand mixer), whip heavy cream until it begins to thicken. Add powdered sugar, and continue to whip until thick and holds stiff peaks. Move whipped cream to a separate bowl (if using bowl of elecric mixer). Add 1-2 tablespoons of graham cracker crumble into the bottom of 6 serving dishes. Spoon or pipe (with a large piping bag, or large ziplock bag with a corner cut off) strawberry cheesecake mixture into dishes. Best when eaten the day it was made. This recipe can be made sugar free by omiting the graham cracker crumble, and using splenda, (or similar) in place of the powdered sugar. If desired, Cool whip may be used in place of the whipped cream (I would suggest about 1 or 1 1/2 cups). I used full fat (regular) cream cheese. Reduced fat cream cheese has a higher water content, and I have not experimented with it for this recipe. If using fresh strawberries, make sure they are nice and ripe. If ripe strawberries are not available, use frozen. I used frozen strawberries in this recipe, and fresh berries just for garnish. If you use frozen strawberries, make sure they are just strawberries, with no additional sweetener. If desired, you may want to add a drop of pink food coloring to add to the pink hue. I did not add any this time, and you can see the color is very pale pink. 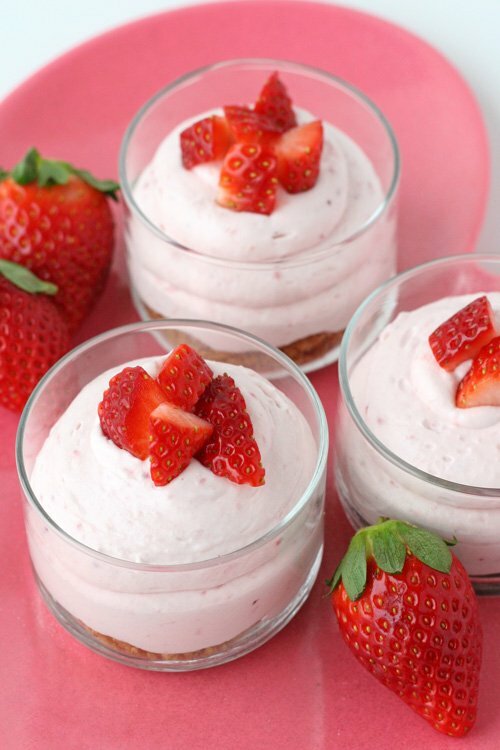 This Strawberry Cheesecake Mousse would be perfect as a Valentine’s treat, or delicious as a light spring or summer dessert. Looking for more Valentine’s ideas? Browse all my Valentine’s Day posts, or find lots of sweet and pretty ideas from around the web on my Valentine’s Day Pinterest board. I like cheesecake…a lot! This sounds so amazing and looks so pretty! YUM! Perfect timing, strawberries are now in season here in the Philippines! I’m going to give this a try, thanks Glory! This looks absolutely delicious! I can’t wait to try it! It’s making my mouth water now! I love these! And that graham cracker crust is definitely not optional!! I am one of those non-cheesecake people. Really, I think cream cheese should be savory. But when I saw this in my feed from you, I knew it would be beautiful….and it is! A little mascarpone may work out for me. So pretty on this rainy January day! Oh wow! These looks heavenly! These caught my eye right away. I am going to try them for my grandchildren. I love this site!! So pretty… they look delicious, too! Can’t wait to try this! 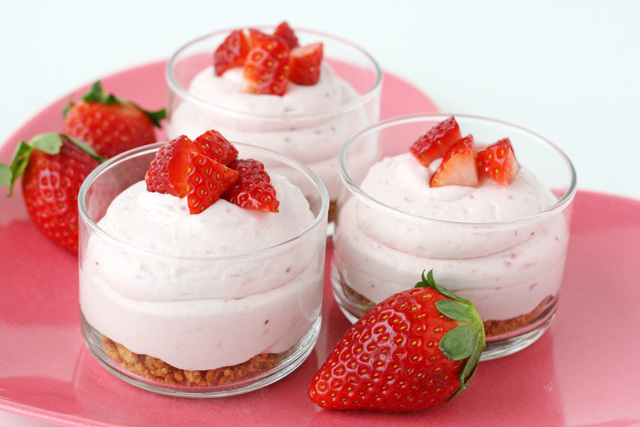 Love anything with strawberries and what a great desert for a pink or baby girl baby shower! These look absolutely amazing! I love the fact that you added info on how to make it sugar free. Beautiful photos, too! This looks delicious, I can’t wait tot try this. 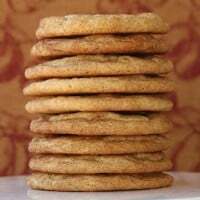 These look delicious Glory! And incredibly beautiful as always! I love simple and tasty desserts like this! I just made this and it’s chilling in the fridge! The filling is delicious–creamy, thick, slightly tart from the berries and sweet. I added 2 TB of Sour Cream for a more tangy end to the mousse. I made these for Christmas Eve and they were easy to make and a big hit! I did add just one drop of red food coloring so they would be nice and pink. I meant to add a little extra whipped cream and a strawberry garnish on top but they were eaten too quickly! You are my go-to gal for desserts when I have company as your recipes never fail me, I plan on making this dessert this weekend and have a question. If I make these ahead (probably 8 hours ahead) will the graham cracker crust get soggy? Even though the assembly would likely be quick, I would love to just take the finished dessert out of the fridge when the time comes. Thanks Glory for all your superb recipes! Super Easy and DELICIOUS! I have made this several times and it is always a hit-Thank you for such a great recipe. This was a hit with my friends as a dip with cookies and extra strawberries.